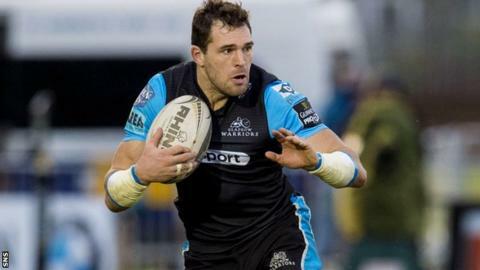 Glasgow winger Sean Lamont wants a league title to his name before he considers retirement. "I've been going at it for a long time," said the 34-year-old before Ulster's visit on Saturday, which will help determine Pro12 semi-final places. Glasgow are second in the table, on the same points tally (70) as leaders Ospreys and third-placed Munster. "A big title, a league title, before I have to retire would be great," he said. "Other than the odd Calcutta Cup win, one year with Northampton we won the European Challenge Cup, I haven't won anything else." Lamont, capped 93 times for Scotland, has no intention of stopping any time soon as he pushes for inclusion at a third World Cup later this year and he is contracted to the Warriors for another season. Career highs include two Six Nations tries at Murrayfield as Scotland beat France in 2006, dramatic triumphs over Australia and South Africa, and an historic series win in Argentina. But, for a man with 11 years of international rugby behind him, Lamont's tangible honours are scant. "You don't want to dwell on things that have never happened," added Lamont. "It [the title] would be a nice little cherry on top. We've been on top of the league most of the year, we've been up there, it would be nice for Glasgow and Scottish rugby as a whole - it's not just myself. "All the coaching staff put in so many hours of work, the same with the players, and unfortunately it's not always judged on how much work you do whether you get the rewards. "But it would be nice to say, look, we were good, and this proves it. You don't really know who came second two years ago, who came third, you know who won. It's just nice to put a little marker down - Glasgow Warriors: yes, we were good." Glasgow came up short in the Pro12 final last season, losing out to Leinster, and a win in Saturday's final round of league fixtures is a must if Lamont's team are to enjoy home advantage in the last four. With the top three all locked on 70 points, it may well require a bonus point against Ulster, the side currently fourth. And Lamont is poised to be involved in some capacity having recovered from knee ligament damage suffered against Zebre in March. "The injury I've had, I've seen it as a mini pre-season, a rebuild," he said. "You don't get the knocks, your body recovers. Yes, you have the current injury to get over, but overall it helps your body having a little bit of a break here and there, and it gets you wanting to go again. "There is a little bit of pressure, but we've got to live to up to that, and top teams do that. "When you're at the top, there's always that pressure to perform. We should be able to deal with it properly and relish that pressure. "It's championship rugby from here on out. This last game of the season is still a big game for us, it's not one where we can sit back and think we've already got our place. We're fighting for everything."